The award ceremony validated over three decades of dedicated effort to serve and train students in the geospatial sciences. My institution was awarded one of the most, if not the most prestigious and coveted, awards in our discipline. 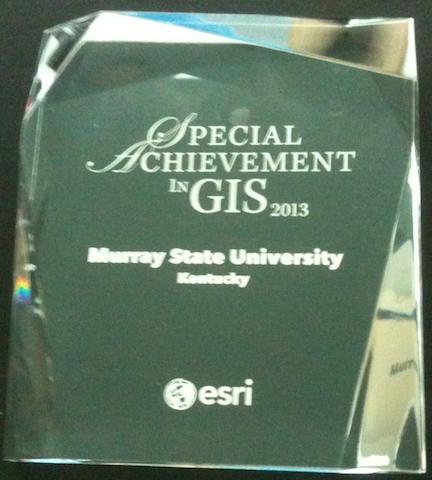 The ESRI Special Achievement in GIS (SAG) award is presented to less than 1/10th of 1% of worldwide users. This afternoon, myself and a fellow faculty person, collected our award in front of our global peers and in the presence of a person widely considered to be the father of GIS, Roger Tomlinson. In many ways, too many, actually, being highly invested in the realm of higher education, not only does the award validate the endeavors of my predecessors but vindicates most of them as well, too. Higher Education contains many fields people the “person on the street” may have no basis for understanding, like “Computational Biology,” or “Radiative Processes in Quantum Physics” (these are real fields, taken from the UC-Berkeley and Columbia graduate catalogs). But those institutions are icons in the milieu of learning. Small regional universities experience the same level of public and at times institutional ignorance. Administrators have no idea what “GIS” means, and “remote sensing” translates into jibber-jabber. “How can you sense something, and also be remote from it? I don’t understand.” Clearly. My predecessors fought valiantly for grants and contracts, grants and contracts which produced copious amounts of research results, provided dozens of people with experience in programming languages (HTML, Visual Basic, C/C++, AML), database development, data collection, GPS, and of course, geographic information systems and remote sensing. Our faculty and staff have trained people from Colombia, Korea, Iran, China, Turkey, and India in remote sensing and GIS methods. No, these are not university students; these are professionals in their own right traveling from their home country to learn from us. The list of countries representing international students we have educated and graduated is much longer. Our graduates, both undergraduate and graduate, are employed around the world. We have students working in Italy, Malaysia, Singapore, Saudi Arabia, and Texas… These are natural-born U.S. students living abroad, not international students returning to their home countries. They work for environmental consulting companies, National Geographic Society, ESRI, the CIA, the National Geospatial intelligence Agency, the United States Department of State to drop a few names. Our students have produced map products for Gen. Colin Powell, setup networks in the Green Zone, Baghdad, Iraq, and built GIS capabilities at Bagram Airbase, Afghanistan. Our former students build the visualization databases which power the helicopter simulators at Ft. Campbell, KY, power the tank simulators for the U.S. Army, and power the flight simulators for the U.S. Air Force. Our former students assist in managing our local, state, and federal utility infrastructures, ranging from the planning office in the town in which our university resides, to county utilities in Arkansas, cities like Nashville, TN, rapidly growing counties like Loudon, Co., Virginia, to companies whose business is our national fuel supply, like Shell. Yet, in spite of years of producing successful students employed in a spectrum of disciplines, we are incessantly badgered and threatened by administrators to “justify our existence or else your program will cease to exist.” Brilliant. “Oh, and by the way, we don’t understand what you do so we aren’t going to fund your computer labs or travel and you are going to have a really hard time paying for your software licenses because we are going to cut your budget. Even though your classes are filling up, and your department needs to add more sections of some courses, you will have to do more with less until you have many more students which might lead to you to think you are safe from more cuts. Far from it. That you somehow continue to exist in spite of diminishing resources means we must still be funding you beyond your needs so we will cut you again.” How does this promote education, learning, help our students, our economy, and our society? Your logic is lost on me and I’m a professional geographer. The last fifteen years I have spent working with biologists, mostly. We worked on contributing to the first large-scale biodiversity study for the United States, the GAP biodiversity program. We have worked with some fellows in agriculture, occasionally. Faculty have assisted local entrepreneurs and farmers, spectrally analyzing soybean, corn, and tobacco crops. A few of us have acted as consultants in the development of farm management apps. Don’t worry, we aren’t getting rich. Farming apps are nowhere near as popular as a Twitter or SnapChat app. Ten years ago I worked with telecom folks. We developed some of the very first maps depicting broadband use, and non-use, in Kentucky. Later, our methods were used to research broadband access in Tennessee. Eventually, these methods were used across the United States in assessing broadband penetration. Just this last May, our local planning city planning commission budgeted $100,000 for the creation of a multi-purpose path for city residents based on a course project of one of our faculty. This project is the most recent in a series of course projects aimed at improving the “livability” of our town, which was recently appointed the “Friendliest Small Town in America.” Did the judging committee even visit? One of the first projects was the identification of neighborhoods within 1/4 of a mile from schools needing sidewalks. Sidewalks promote health, reduce crime, increase awareness, decrease traffic-related injuries, and provide another option for getting to school, or the movies, or McDonalds. The following course-load of students identified city streets conducive for bike lanes. Make no mistake, the real-world consequences of each effort was not the point. That each project resulted in new sidewalks and bike lanes was a wonderful side-effect, the results were simply that, a side-effect. Learning how to work within a team, to handle data, to learn the city planning process and work within those constraints, to deal with software issues, presenting the tribulations of effort without regard to actual adoption – that is the real goal. People often mistakenly confuse immediate results with proof. Results are nice but positive results can lead one to believe success is the only real educational value. The lessons taken away are more important. One year beyond graduation what are students able to remember, what experiences are they able to use, to draw upon? Not just the buttonology, but the methods, the problem-solving, the critical thinking skills. All of us, my peers and academic allies, have practiced patience and have persevered much like our students have done in order to attain this newest accolade. To all of them, I say “thank you” for building a superior foundation, for fighting the good fight against administrative blind ignorance, and for persevering throughout time, through funding cuts, through economic, technological, and pedagogical hardships.